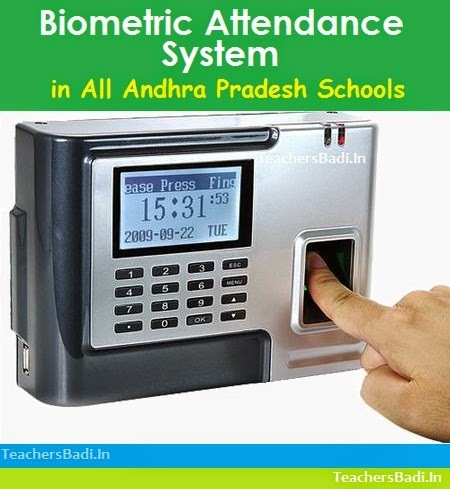 Biometric attendance system in AP schools, Biometric attendance register for ap teachers and AP students, Biometric attendance monitoring, AP govt to introduce biometric system in School Education. Certain instructions and Guidelines for implementation of Aadhar Enabled Biometric Attendance System (AEBAS) in the Department of School Education. AEBAS Aadhar Biometric Attendance System in School Education, Guidelines, AP Rc.57, Dt:13-02-2017, Implementation of Aadhar Enabled Biometric Attendance System in School Education Certain Guidelines. Sub: School Education -Implementation of Aadhar Enabled Biometric Attendance System (AEBAS) in the Department of School Education - certain information - Reg. 2. Letter dt 03-10-2016 addressed to District Collectors on collection of biometrics for students. 5. Our office Lr Re.No. 58/IT CELL. (PMU)/2016, dated 02-11-2016 addressed to UIDAI. I wish to inform you that as directed by Hon'ble Chief Minister, the School Education Department is implementing the Aadhar Enabled Biometric Attendance System (AEBAS) in 40,000 Government Schools covering about 35,00,000 students and 1,70,000 teachers, Teacher Education Institutions and other administrative offices. Vide reference 2 cited, APTS has finalised the tender and informed that M/s Karvy Data Management Services Ltd., Hyderabad and M/s Analogies Tech India Ltd., Hyderabad are the l,I vendors for supply of Biometric and Iris based Devises/TABS respectively. Accordingly the School Education Department has signed MOU with both the vendors on 18·11·2016 for supply of Bio Metric and Iris devices 10 the School/office point. After several rounds of discussions and testing, it is decided to utilise the software applications developed by APOnline and CGG for AEBAS at school level. In this context, the District Collectors are hereby requested to effectively implement the AEBAS across all schools and Offices in School Education Department. 1. The Offices of CSE, SCERT, RSDs, DEOs, MEOs and Schools of all categories including Government, Zilla Parishad, KGBVS and AP Model Schools are to be covered. Teacher Education Institutions. including IASEs, CTEs and DIETS are also to be covered. 3. M/s Analogies Tech India Ltd., Hyderabad will supply 7' tablet based AEBAS with STQC certified IRIS scanners @ one per school. M/s Karvy Data Management Services Ltd., Hyderabad will supply tablet based AEBAS with STQC certified finger print scanners@ one device per 100 students. The Hardware vendors arc to supply the devices as well as maintain them for three (3) years. The terms and conditions of contract with the Vendors is at Annexure 1. 4. The Software application developed by CGG and APOnline is to be tested and utilized i11 the Schools and Teacher Education Institutions. Jt is also proposed to make use or these applicauons as well as NJC application for the offices of CSE, SCERT, DEOs and M EOs. The User Manuals for implementing AEBAS are enclosed and available at www.cse.ap.gov.in. The procedures/ process to be followed at the school or at the office point is detailed in Annexure II. Instructions are to be issued to all the Headmasters and Teachers LO carefully read and understand the procedures to be followed while implementing AEBAS in their schools/ offices. 6. The AEBAS devices/TABs will be supplied to the school/office point after preloading with the necessary application, integration with the central Server and will be embedded with SIM cards. Respective Service providers like Airtel, BSNL, Idea ctc., wil] be providing the necessary data services upto 500 MB capacity. 7. As OU arc aware, as 011 dale the data of 99.75 o/o of all students enrolled in government schools is Aadhaar integrated. Some students have ED and 0.25% ( 17,J 50) need to enroll and obtain Aadhaar number. Please facilitate the process for getting Aadhaar enrolled and for collection of biometrics for students who do not have the same, as requested in this office letter cited 5 above. 8. Jn some districts, like West Godavari, AEBAS is already being implemented in DEOs offices and in some schools. While the DEOs office AEBAS may be linked to the NIC system, it will be better the schools AEBAS is integrated to the CGG and APOnline applications for smooth reporting, consolidations and appropriate linking to CORE: Dashboard. Action may be taken to take up for Aadhaar seeding of employees data to their Treasury ID and ensure completion by 20.2.2017.
b. Nominate a Divisional Level Nodal Persons (Oy.E.O/MEO) lo monitor the implementation of AEBAS in the district. c. Appoint one Nodal Person to support and coordinate implementation or AEBAS in the district in all schools and offices of School Education Department from among the Learn members of the PMU/TT Cell constituted recently. Contact details of the same may be communicated on or before l S.02.2017. d. Nodal persons will be provided with TABs to keep track or emerging issues, grievances, monitor reports and dash boards relating to utilization and performance of the schools, for appropriate escalations and ensuring effective implementation or AEBAS. e. Monitor the AEBAS through dash board provided at https:/ /ese.ap.gov.in. A video conference is scheduled on 14-02-2017 at 02.00 PM to 04.00 PM. ensure that the District EducationaJ Officer and his team attend the Video Conference and apprise themselves of action to be taken to implement AEBASin your District. Enabled Biometric Attendance Systems is effectively implemented m the schools, offices and Training tnstiruuons in the district. a. The Vendor is responsible for supply, unpacking, assembling, wiring, installations, cabling between units and connecting to power supplies. b. The Vendor will test all hardware operations and accomplish all adjustments necessary for successful anti continuous operation of the hardware at all installation sites. c. The Vendor should provide necessary technical support to the Software application provider, i.e., CGG and APOnline in this regard. d. Vendor will assign the Machines in presence of District (IT CELL) as per availability of network given (copy of network is appended). e. AEBAS systems will be authorized by the Concerned Head Master/Teacher will be autherulcated through IRIS/Finger Print of the device provided. a. The training will be given al district head quarter co the master trainers of district IT Cell. b. For each hardware component installed. (or AEBAS systems the vendor shall be requiredto train the designated HM /Teacher to enable them to effectively operate the total system. Operational training at school for at least two teachers. c. The training schedule will be given by both Vendors and District Educational Officer. The tranung lo Matidal Resource Teachers (1'wo Teachers identified for the schools) will be given at Mandal/Divisional Point identified by District IT cell. d. Software Service Provider (Application Form developer) to provide training on Application software LO master trainers of department (District IT Cell). a. The Vendor ma)' be required to provide any or all the following services, including additional services, such as Performance or supervision or maintenance and/or repair of the supplied goods and services, for a period of time agreed. 1. The Vendor shall be required to provide any or all of the following materials. notifications and information pertaining lo spare pans manufactured or distributed by the Vendor. u. The Vendor shall maintain minimum J0At buffer stock of offered equipment at each district head quarter/ Revenue divisions. iii. The Vendor shall enaure availability of spares in stock al his nearest service center for immediate delivery such spare parts as: (a) arc necessary for a minimum of 3 years of operation (b) arc necessary to comply with specifications. LO tne Purchaser Of the pending termination, in sufficient time to permit the Purchaser to procure needed requirements. 1. The Vendor warrants that the goods and services supplied under the Agreement are new, unused, of the most recent or current models, and that they incorporate al) recent improvements in design and materials unless provided otherwise in the contract. ii. The Vendor further warrants <hat all goods and services supplied under this Agreement shaJ.J have no defect arising from design, materials or workmanahip or Irom any act or omission of the Vendor that may develop under normal use of the supplied goods in the conditions prevailing in the country of final destination. iii. The Vendor shall, in addition, comply with the performance guarantees specified under the contract. lf. for reasons attributalbe to the Vendor, these guarantees are not attained in whole or in part. the Vendor shall. make such changes, modifications, and/or additions to the goods or any part thereof as may be necessary in order to attain the contractual guarantees specified in the Agreement at its own cost and expenses and to carry out further performance tests. iv. The equipment supplied should achieve required up time. v. Head Master /Teacher shall promptly notify the Vendor in writing of any claims arising under this warranty through Online only. vi. Upon receipt of such notice, the Vendor shall, within the reasonable period and with all reasonable speed, repair or replace the defective goods and services or parts thereof, without costs to the user. viii. Any Physical Damage on account of Miss handling of device and accessories such as cables and charger will not be covered under warranty. For Such Damages the Concerned Head Master/Teacher will be responsible Lo replace the AEBAS Machines. a. Por any delay beyond permissible down time, a penalty or Rs.200/- wtu be levied fOT each week or part there of subject lo a. maximum of total equipment cost. b. The penalty amounl wil! be deducted from the amounts payable Lo Vendor by the Commissioner of School Education. b. For the offices at District Head Quarters, the Vendor should resolve the breakdown calls on the same day of call reporting. If not feasible should be resolved by 11.00 /\M on the next working day. c. For the offices at other sites, the Vendor should resolve the breakdown calls within 24 Hours of cell reporting. Failing which penalty is applicable as per terms Ssconditlons. d. lf any spare parts arc to be replaced, the call shall be completed within 48 Hours excluding holidays from the date of attending the call. If the device is irreparable it should be replaced with an equivalent or better device. e. The devise may be affixed to a wall or placed on a Table or can be taken to each class for taking attendance of the students and teachers. d. Based on the Aadhaar seeded student id details a QR Code is generated for every siudem and is printed with self-adhesive sticker given . This should be stuck on the note book/ pad. c. 'foll F'ree Number arid the contact details of the Mandal Cluster l~esourcc Persons to be provided by the Vendors should be displayed al Head Masters Office/MEO/DyEO/Principal offices. r. 'Tbe concerned Nodal persons should maintain a Register for noting complaints raised by the schools. g. After scanning the QR code, the student should place his fingers at the given slot for biometric scanning. In real time the biometrics of the student/teacher/employee arc authenticated with the Aadhaar Server and confirmed. h. In case there is a repeated failure of biometric authentication for any particular students teacher. the Tris based devise should be used and attendance is to be given through the Eye of the student/teacher. J. The existing Physical Attendance System may also be; continued till the AEBAS stabslizcs. a. There are several reports that would be made available al V.l'\V\v.cse.ap.gov.in relating to AEBAS. b. Supervising and Inspecting Officers are instructed to refer to these Reports and rake necessary action where required. c. All Reports will he linked 10 the Honorable CM's CORE Dash Board arid also will be available public domain and visible real time. a. During the first 3 months of implementation of the project the vendor is LO place maintenance support at rhe district/division/mandal level. For any problem that the Headmaster may contact support or raise in RTS. b. If data services are disturbed and not working for some reason, the Headmaster may contact support or raise in RTS. c. The Software providers have set tip a Request Tracking System (RTS) and it can be accessed al \\'\V\-v.csc:.8.p.g,ov.in and in device it self. d. 'rhe School Education Department will inform the Nodal Team to be contacted at different levels with in the district in the following format.